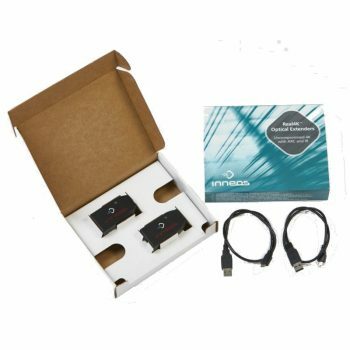 The AC-EXO-UNC-KIT is a HDMI extender over fiber optic cable. 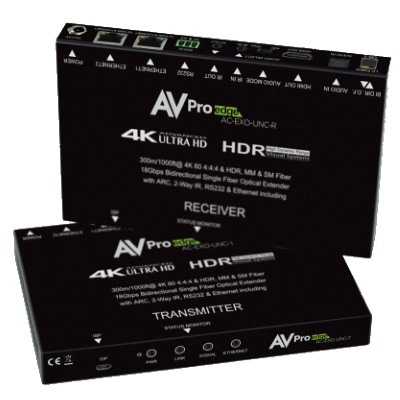 It allows for ultra long distance extension of HDMI signals (1.25 miles or more). 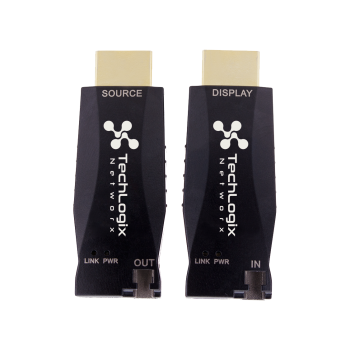 All HDMI 2.0 a/b signals are supported as the bandwidth is 18Gbps. 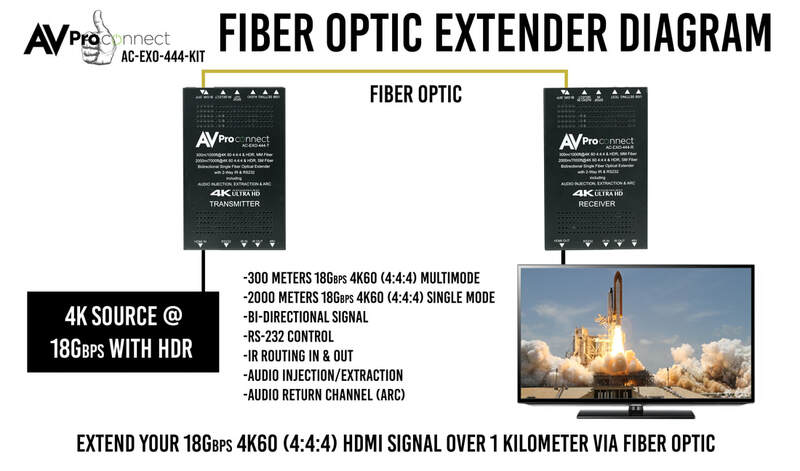 The AC-EXO-UNC-KIT is a HDMI extender over fiber optic cable. It allows for ultra-long distance extension of HDMI signals (2km has been tested successfully). 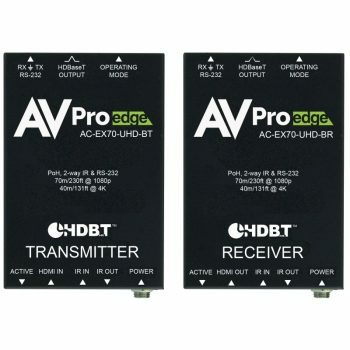 All HDMI 2.0 a/b signals are supported as the bandwidth is 18Gbps. With the (AC-EX0-UNC-KIT) you have the ability to functionally do the same thing as a traditional HDMI extender via Cat 6a; take an HDMI signal and extend it over long distances. The integrator is able to get control, IR, RS-232, audio extraction, built in test patterns and EDID management from this unit. 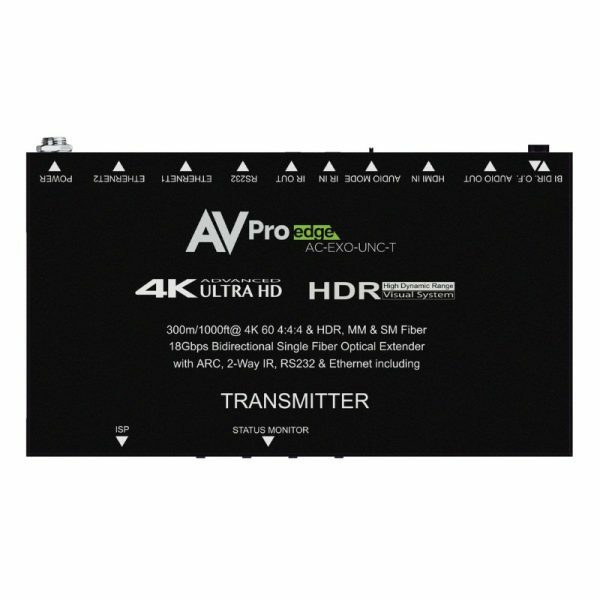 What makes this extender stand out is its ability to do all this while delivering a fully uncompressed signal at much longer distances. This is the extender you use when you need zero compromises, when you need zero compression and full 18Gbps signal distribution. 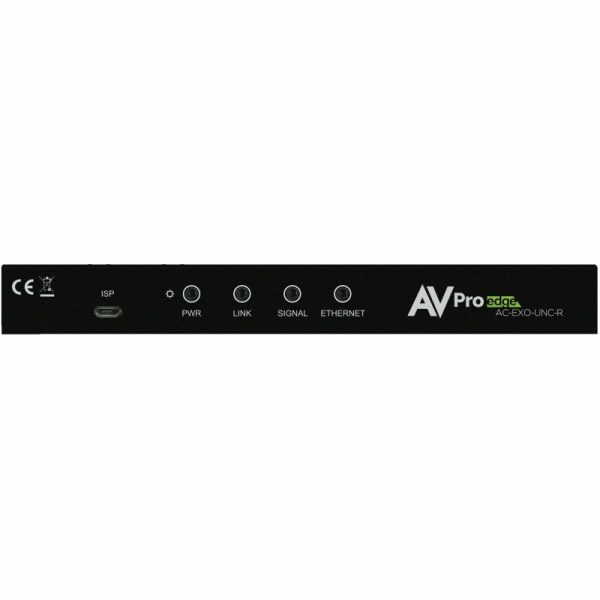 AVPro Edge’s uncompressed fiber optic extender allows the user to extend a 18Gbps HDMI signal 2 kilometers via single-mode fiber, and up to 300 meters using multi-mode fiber. While our other extenders use ICT (Invisible Compression Technology) to send 18Gbps, this extender uses zero compression, delivering the 18Gbps signal completely untouched. Deep Color and HDR Metadata remain intact making the transmission free of artifacts like banding or color distortion. Other similar devices will deliver a sub-par image that has very visible banding and color shifting. This uncompressed HDMI extender solves problems for both commercial and residential markets for distributing high value 4K 18Gbps content from rack to display. 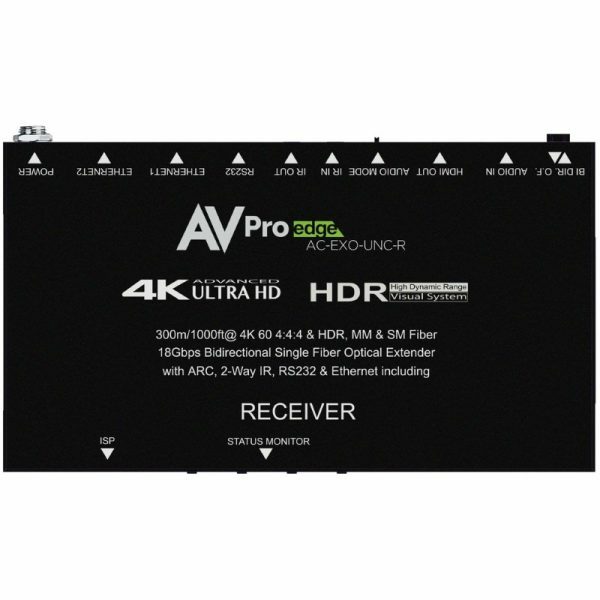 These extenders go the distance, no need to find power and cascade extenders for ultra-long runs, this unit allows you deliver a HDMI signal further than ever before. 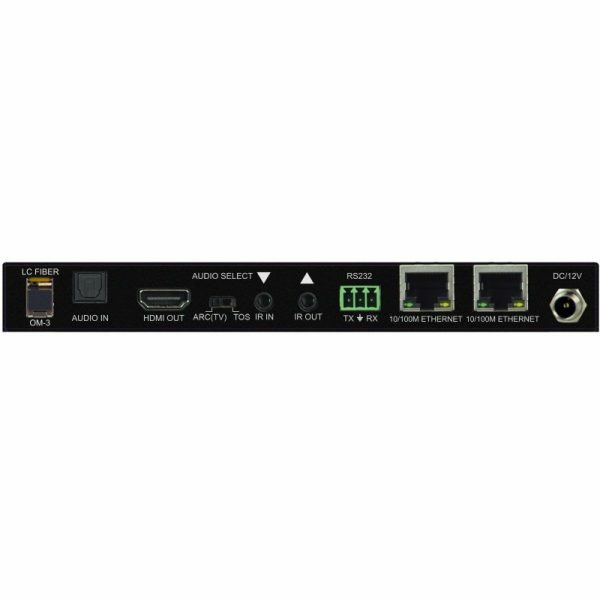 The AC-EX0-UNC-KIT offers solutions for 18Gbps distribution in residential, digital entertainment centers, retail stores, AV events that require reliable and long distance distribution, suitable for Data Center, Control Rooms, Conference Rooms, Schools and Corporate Training environments. 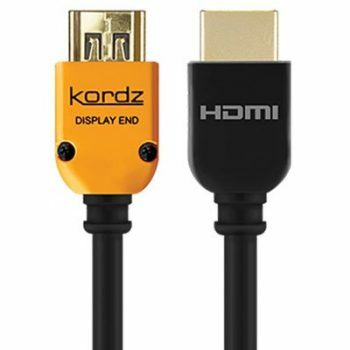 This is your choice for uncompressed HDMI extension. Extend 4K 60 4:4:4 and HDR Signals: Distance is no longer an obstacle. By using the AC-EX0-UNC-KIT you can go virtually any distance you require. This extender kit supports up to 2 km (1.25 Miles) when using a single strain of single-mode fiber or 300m (1000ft) on a single strain of readily available OM3 Multi-mode fiber. Down Scaling: The AC-EX0-UNC-KIT has a scaling circuit built into the transmitter. The scaler can scale 4K (and HDR) –> 1080P. A common application for this is when you have a 4K distribution and you have one or two displays that are older. You can use the extender to scale down where you need to and not have to reduce the entire system. The AC-EX0-UNC-KIT does the heavy lifting, eliminating the need to add additional boxes. This is an ideal choice for extension for projects requiring an 18G matrix like the AC-MX1616-AUHD. The EDID Copy Function allows you to copy and save from any display or projector you want to. 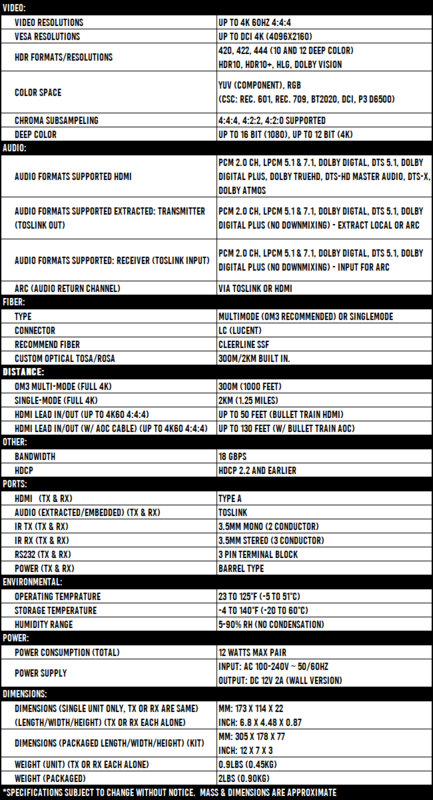 On Board Troubleshooting: This unit allows you to generate a 1080P or 4K test pattern to identify external problems (source, repeater, displays, etc…). You can now be sure that your wiring is correct and get to the bottom of problemsquickly should they arise, without having to worrying if the source or sink is working properly. You can generate a test pattern from the Tx or the Rx so you can verify total system infrastructure integrity. Future Proof: Using Fiber Optic infrastructure is the only way to future proof an installation, now you can run fiber in confidence and use the AC-EXO-UNC-KIT​ to deliver 18Gbps to your customers! IR & RS232 Management: IR & RS-232 are bidirectional and can control the sources from the sinks or vice versa. In addition you can use the I-PASS port to plug you Control System emitter ports directly into the IR (I-PASS) port on the transmitter (via mono 3.5mm cable) for clean and reliable IR pass through, our unique VPC (Voltage Protection Circuit) allows you to do this without wear and tear on the electronics inside. Ethernet Extension: Alongside the audio, video and control signals. This extender also will carry your network, internet or other ethernet signal. With ethernet ports on both the receiver and transmitter you can hard wire your computer, gaming console or wireless access point directly from this extender. All of these signals are passed over the fiber optics at the same time, giving you additional reasons to make this fiber optic extender the one to choose.